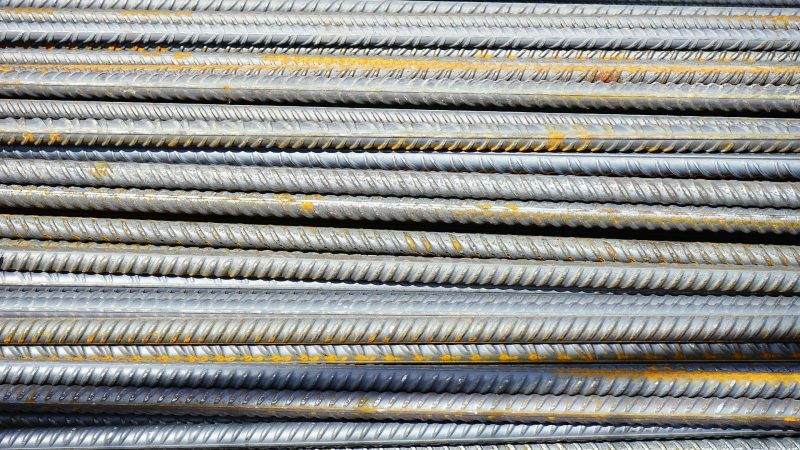 The additional duties for steel will be 25% and will apply to all countries except Canada and Mexico. The covered tariff numbers are 7206.10-7216.50 (ingots, rods, angles, bars) 7216.99 -7301.10 (sheet piling, wire) 7302.10 (rails) 7302.40-7302.90 (sleepers, plates), 7304.10 – 7306.90 (pipes, hollow profiles, tubes). Aluminum articles will be subject to a 10% duty rate increase. The tariff numbers covered are 7601 (unwrought aluminum, 7604 (bars, rods, profiles) 7605 (wire), 7606,7607, sheet, strip, foil, plate, 7608,7609 (tube, pipe, fittings) 7616.99.5160, 7616.99.5170 (castings, forgings)The collection of additional duties will be collected via an alternative 9903 tariff number. Importers and countries can petition to be exempted from the additional duties based on certain requirements. It is expected that it will take Commerce at least 90 days plus to act on petitions and unknown at this time if the petition is approved if the entries already filed will be available for duty refund. Domestic Trucking- rates for long haul trucking continue to increase based on new driver time regulations, Local FCL rates are also on the rise based on driver, equipment and port congestion issues. Peak season could see some very sharp increases in trucking costs. Airfreight- rates are down as post CNY activity continues to pick up. Ocean Freight- Carriers continue to scramble to fill vessels with weekly spot rates. This would be a good opportunity to load up on inventory prior to the summer season. Many truckers report multiple challenges hitting at the same time; seasoned drivers retiring, delays/congestion in terminals, lack of chassis equipment, new driver regulations and fuel increases. All of this translates into higher delivery costs for consumers. We have noticed with larger vessel’s calling ports drivers are in short supply for four to seven days after discharge causing storage in some cases. Shippers should be prepared for delays and increased costs especially as we enter the busy summer season. The Port of Oakland announced the approval of a new Seaport Logistics Complex. The construction is set to beging this summer. The 27 acre site will be located near the new railyard and just across from the Marine terminals. The Port believes the new 440,000 square foot facility will attract additional container activity. The number of IPR seizures by U.S. Customs and Border Protection increased in fiscal year 2017 to 34,143, while the total manufacturer’s suggested retail value fell about 13% to $1.21 billion. The hot commodities continued to be watches, jewelry and wearing apparel. China and Hong Kong continue to account for over eight-five percent of all seizures. The Foreign Supplier Verification Program (FSVP) deadline is March 19, 2018. This requires US Importers whose suppliers are small businesses to have a fully developed documented FSVP for each food item they import. I would like to focus on the importance of legible, complete and early documentation being the ingredients to a successful clearance. Please take a moment to review the documentation supplied by clients to make sure it is complete prior to forwarding to us. In most cases we can pre-file your entry before vessel arrival if all documents are in order. When we have to go back and forth for complete documentation the process slows down. The time to ask about questionable items that may be restricted/prohibited is prior to shipping. These are the fish & wildlife (ivory, skins), vehicles, weapons, alcohol to name a few. For your export title validations we need those documents well in advance of the vessel departure. Each port documentation requirements differ slightly so please contact the CCI office at the last US port of loading for the documentation and time submission requirements. The year has started out with some interesting actions on Steel and Aluminum. The administration is also looking at other tariff increases on China made products that could be announced in the next month. This is a new negotiation method that we haven’t experienced with past administrations and it will be interesting to see how it plays out. We continue adding new modules to the ACE program most recently drawback and entry reconciliation. Each module has bugs that are encountered but the progress is steady for full implementation likely next year. 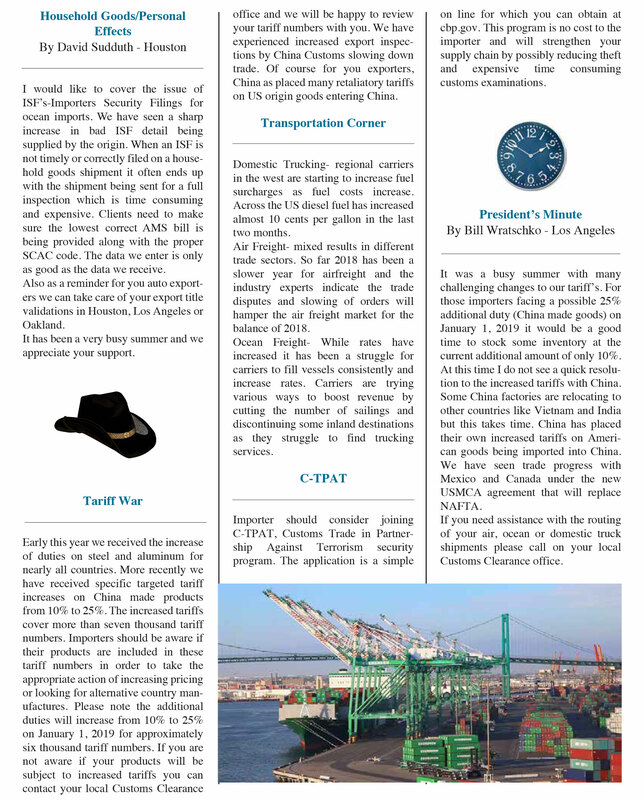 Importers are encouraged to download and read the copy of the US Customs publication “Reasonable Care” posted on our website which outlines many of your responsibilities as an importer. 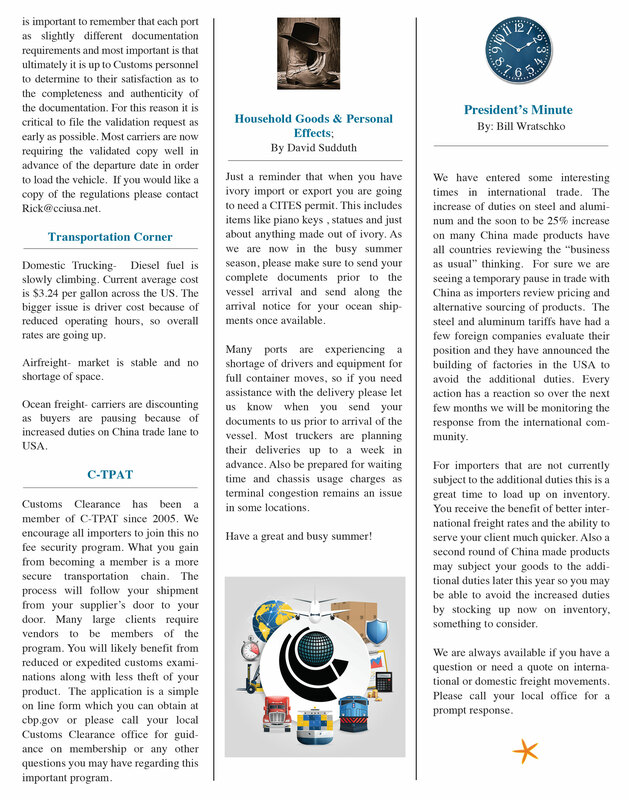 When you have a transportation requirement local or overseas please call your local CCI office for assistance. We offer true door-to door solutions. Appreciate your continued support. Due to staff and other resource constraints, most government agencies are no longer issuing renewal notifications. Once a permit expires, most agencies will hold the shipment until the renewal is completed. This can cause unnecessary delays and costs. If you currently hold a permit, please check the expiration date and renew it prior to the expiration. The above is a brief list of the common import permits and registrations required. Should you hold any government permits or require any registrations, please review them now and renew accordingly. 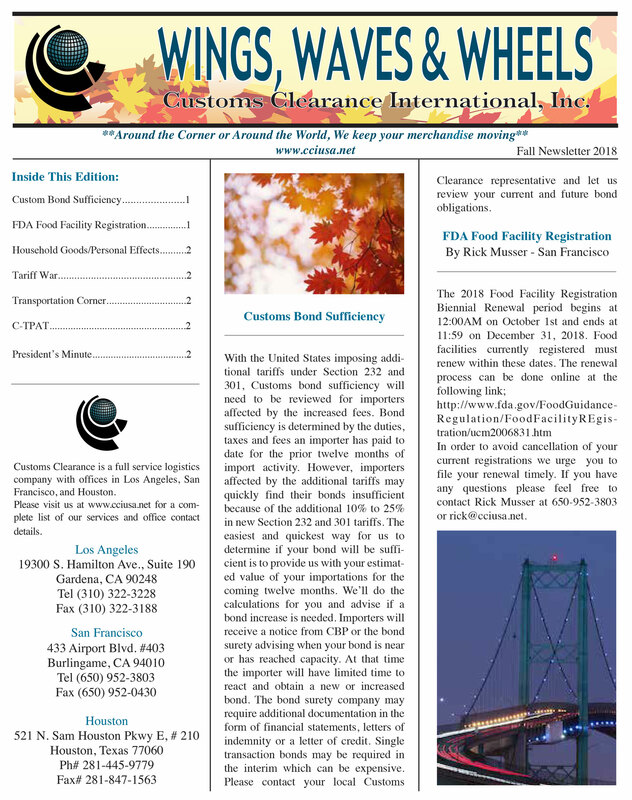 Most non-commercial personal shipments will not be subject to the above permits and registrations. However, if in doubt, please contact your local office for clarification. GSP is the program that allows for duty free status of certain products from specific countries. This program expires on 12/31/2017 unless renewed. By law, all items previously duty free under the program will now be dutiable at column one, normal trade relations duty rates. In past years when GSP expired it was renewed with a retroactive clause for entries filed during the expiration period. We will continue to flag entries when filing with the GSP special indicator so in the event GSP is renewed with the retroactive clause importers will automatically receive a refund of duties paid. Importers would be wise to adjust their current pricing to assume no retroactive refunds of duties will be authorized. 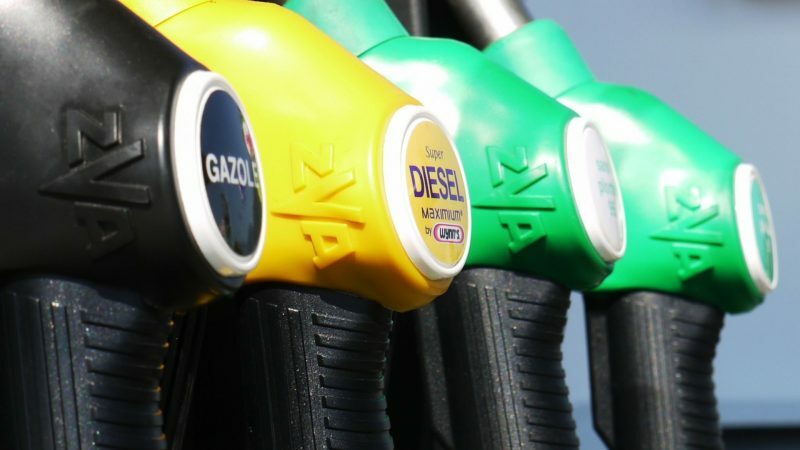 Domestic Trucking- The average cost for a gallon of diesel in the US was recently $2.92 but in the state of California it was $3.59. This is because of a recent 20 cent per gallon additional tax on diesel that went into effect on Nov. 1, 2017. Fuel surcharges for local California truckers are on the rise. Ocean freight- rates remain unstable as carriers continue to work hard to fill the mega vessels. Many US ports have reported record container handling volumes for 2017. Airfreight- airlines figures indicate a 9% growth over 2016. I suspect we will see this continue to grow as the small package door delivery services for on-line retailers continue to explode. CBP has announced that the merchandise processing fee charged on ocean import shipments arriving at a US port will increase from the current minimum of $25 to $25.67 and the current $485 maximum per shipment to $497.99 starting on 1/1/2018. Automated in-bond filings On Nov. 27, 2017, CBP started using the automated in-bond process. This allows merchandise to move under bond from within the United States or through the US for export under bond. The new electronic program will eliminate the old paper 7512 form and allow CBP to better track shipments to ensure they were properly entered into commerce or exported. The new program has a 60 day close out period for the transaction. It was great to visit with many of our clients at the IAM meeting in Long Beach, California in October. Bill and I have been attending these meetings for more than thirty years and always come away making new friends from around the globe. As 2017 comes to a close we want to congratulate Debbie Foster on her retirement at the end of December. Debbie, thank you for the many years of service and we all wish you the best! (We might call you for summer rush, LOL). Ms. Tabitha Denny joined us a few months ago and will be taking over for Debbie. Tabitha has many years of experience in the brokerage industry and I am sure you will enjoy working with her. You can contact her at Tabitha@cciusa.net . We wish you a very Merry Christmas and a Great, Safe and Happy New Year. What started as a slower year in the first quarter continued to build momentum and finished well. During the year we adapted to new ACE computer programs and the many government agency regulation changes. This year we also revalidated our participation in C-TPAT which is the CBP security program. We strongly encourage all of our clients to become members of the program. If you would like to learn more about the program and benefits please contact your local office. As we come to the close of 2017, I want to thank our many clients for their continued support and for the continued referrals of new clients. Wishing you a prosperous 2018 ! 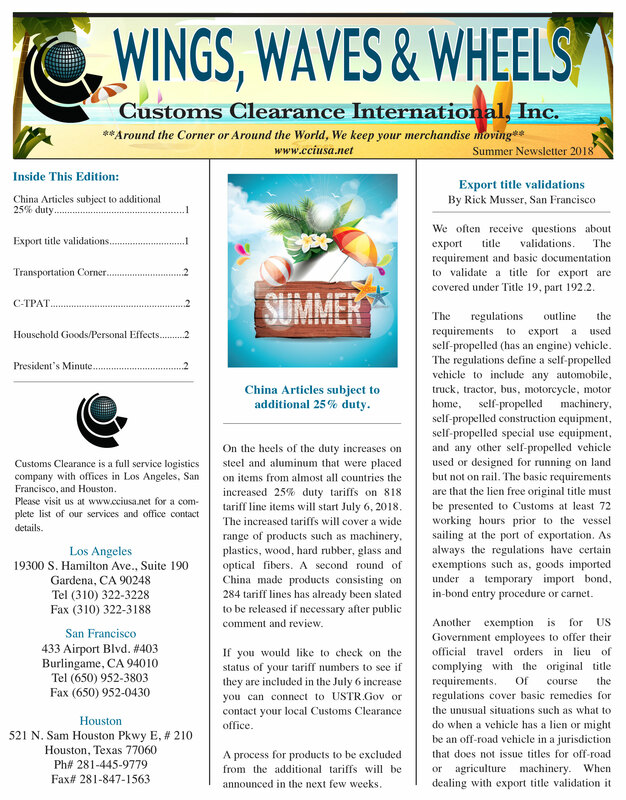 Copyright © 2018 Customs Clearance International, Inc. All Rights Reserved.